The Ankle Brachial Index (ABI) is a measure of the severity of atherosclerosis in the legs but is also an independent indicator of the risk of subsequent atherothrombotic events elsewhere in the vascular system. The ABI may be used as a risk marker both in the general population free of clinical CVD and in patients with established CVD. Continuous wave Doppler ultrasound is considered a reliable tool and was validated and accepted into routine medical practice. The literature recognises the importance of assessment in the management of a patient with chronic lower limb ulceration. The evidence from the medical literature indicates that a "normal" ABI is 0.91 or greater, a ratio below this indicating arterial disease. Patients with DM may have calcified and hardened lower extremity arterial walls that cannot be readily compressed and occluded with blood pressure cuffs. This produces falsely elevated ankle pressure readings that are often in the "normal ABI range" (0.91 to 1.4) or sometimes in the non-physiological range of above 1.4. However, Calcified leg arteries in Diabetes Mellitus or dialysis patients may yield falsely elevated ABI results. 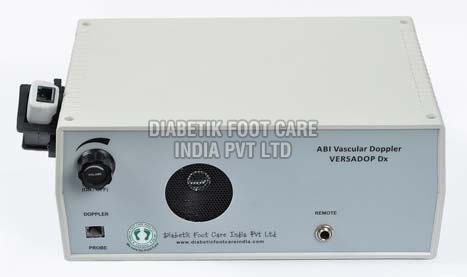 VERSADOP Dx, ABI vascular doppler is compatible with any Windows based computer and get connected through an USB port. The software supplied helps to transfer the waveform data from the unit to the computer for storage and patient report generation.